New Yorkers simply love their Italian food, so much so that you will be hard-pressed to find a street in the city without an Italian restaurant. With so many competitors it can be tough choosing a good quality restaurant, which is where Ecco comes in with their authentic food and modest prices. Ecco is particularly popular with locals coming for lunch during the working week but remains relatively undiscovered by tourists. Must Try Dishes: One of the favourites here is the Gnocchi con (with) Pesto. The sizes are plentiful and the basil and garlic flavours are divine. This is perfectly paired with some Italian red wine. 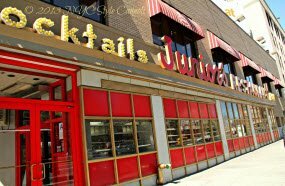 Whilst it can’t quite be considered fine-dining, Juniors is considered to have New Yorks best cheesecakes. Since opening their doors in 1950 Juniors has been famous all across the world for their perfect cheesecakes. The Brooklyn location is the flagship store, so you can see where all the cheesecake goodness started. Today you will find a 1950’s themed restaurant serving both full meals and cheesecakes in a very family friendly environment. Must Try Dishes: The cheesecakes of course! The cheesecakes are left to sit for 48 hours to allow for the aromatic and pungent flavour. The modern cheesecake originated in Brooklyn and here you get the choice of 13 flavours, chocolate mousse being our top recommendation with its rich and creamy taste. Rated the Best BBQ in NYC three years in a row Fette Sau is a must whilst in town. Only organic meat from family-owned farms are used to ensure that the best quality meat is provided. The interior resembles an upmarket butcher with knives on display, rustic benches to sit on and exposed brick walls, a vast contrast to modern New York. Must Try Dishes: America is undoubtedly famous for BBQ meat, at Fette Sau they offer some of New Yorks best. The menu changes daily, but there is always some a cut of beef and pork to choose from. Considering beef is more traditional to America and cooked in more varieties here (pastrami, brisket and ribs just to name a few) we suggest tasting the beef. 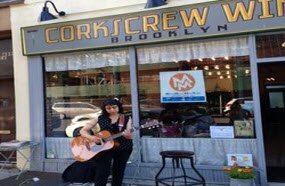 Corkscrew Wines opened as a passion and labour of love, being the only store in New York – and maybe even the world – that focuses on female-produced wine. All wine sold is carefully picked, ensuring it was grown in a sustainable way, harvest by hand and contains only native yeasts. Inside you will enjoy the family-friendly atmosphere and the endless choices of wine. Must Try Drinks: Come in on Saturday evenings between 5-7pm for free wine tasting sessions. These wines are always on rotation so you can happily try different wines each time. From here, choose your favourite for a larger glass (or bottle)! 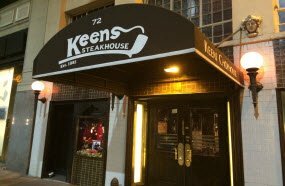 Established in 1885 Keens Steakhouse retains its old-school New-York atmosphere without feeling pretentious. In factthe atmosphere is so vibrant that many people comment on how hard it is to leave. Keens will remind you of why so many people fall in love with this city. Must Try Drinks: When you’re in Manhattan, you cannot leave without trying the famous cocktail with it’s namesake; the Manhattan! Served in the traditional martini glass you will enjoy your perfectly balanced Manhattan, not too sweet, not too bitter with cynar used as the secret ingredient. 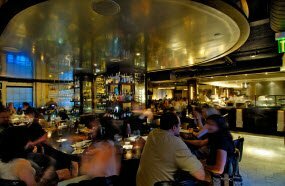 Keens commonly features in lists of the best places for trying the Manhattan in New York. 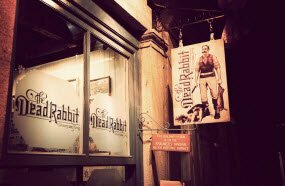 When it comes to cocktails, The Dead Rabbit is unbeatable, quite literally. It was voted the ‘Best Bar in the World’ for 2015.Their drink menus are so extensive they are contained in bound books, categorised by stirred and shaken cocktails, also featuring seasonal suggestions. You can find absolutely verything you could possibly want here; after all, they aren’t the best bar in the world for nothing. Must Try Drinks: Our favourite cocktail is the Total Diva, a great combination of alcoholic and non-alcoholic drinks (gin and green tea) and beautiful additives such as almonds, lime leaves, fennel and cream. This refreshing drink is perfect for a hot summer evening, but even in winter the opportunity is too great to pass up. Duration: Usually between half an hour and an hour, depending on the visitor's pace.